Looking at the implications of asymmetry on healthcare, especially through-life healthcare for long-term (chronic) conditions. Health Care Reform presents governments everywhere with a challenge. Richard Veryard raises the question here of whether the latest round of changes in the UK will be any different. Between 2002 and 2004 I was involved with colleagues in pathfinder projects, aiming to address these issues in the UK, the report on which can be found here. What follows is a summary of the nature of this challenge as we came to understand it. Type I – defining current demand and realigning product/service protocols to it. Type II – re-organising referral protocols and configuration of clinics to improve delivered health care within existing catchments. Type III – extending the organisation of the clinical service to include re-organisation of the catchments within the Primary Care Trusts. The pathfinders established that the scale of Type II benefits were significantly greater than Type I benefits because of the role of the clinic within the larger Primary, Acute and Long Term Care contexts. It was expected that this would be even more true for Type III benefits, but the pathfinder projects only got as far as delivering Type II benefits. But how could these different levels of benefit have been achieved across the NHS as a whole? To answer this question we needed to understand the role of Architecture. We discussed here a way of thinking about ‘Architecture’. When applied to the context of Health Care, we wanted to understand the way the different kinds of Trust determined the way that care was provided in response to patients’ demands. The traditional approach to improving patient care was to focus on the patient journey through a succession of care pathways relating to the patient’s need for various treatments. For well-defined patient conditions, this meant optimising and aligning the process steps along care pathways in a way that was focused on the effective provision of treatments (i.e. a treatment-centric approach mirroring the way the NHS payment system focused on paying for treatments). These improvements affected the care pathway architecture within which treatments could be offered. Type I benefits were achieved by changing the care pathway architecture of the Orthotics Clinics, through such things as implementing clinical delegation and treatment protocols. The pathfinder projects made a fundamental separation between care pathways and referral pathways. Care pathways defined the way treatments were provided, while referral pathways defined the way patients were enabled to find the treatments that they needed for their particular condition through the way their conditions were defined by doctors subject to processes of clinical delegation. The referral pathway architecture was affected both by the way care was funded – affecting the way the funding of clinics related to clinical specialisms, and also by the way clinicians themselves delegated clinical accountability in how they made use of each others’ specialisms in responding to a patient’s treatment needs. Such clinical accountability was exercised in relation to patient episodes of care focused on particular patient conditions (i.e. an episode-centric approach as defined by the ‘senior’ clinician involved). Type II benefits were achieved by changing the referral pathway architecture governing the way patients reached the Orthotics Clinics, including such things as direct referral and universal review processes, both of which meant changes to the way clinical accountability was delegated. Achieving both Type I and Type II benefits were essentially about how the Healthcare system responded in aggregate to patients. Not all patients could be responded to solely in terms of the condition that they presented with, involving multiple interacting conditions developing in ways that were specific to the patient’s particular context-of-life, for example being old! The multiple interacting conditions experienced by such patients could be reduced in their effects if approached on a through-life basis. Thus (for example) the screening of diabetic patients or of children with special needs could reduce the risk of later complications arising. To respond to such patients, pathways needed to be not just realigned to be more appropriate to current aggregate patterns of patient need. They needed to be capable of being dynamically aligned in response to individual patients. This involved creating a health risk governance architecture through which the different Trusts collaborating in the provision of care could make such dynamic alignment possible through the way budgets and clinical accountabilities were managed. Each of these architectures depended on the excellence of the architecture at the level below it, and progressively changed the relationship to the recipient of healthcare from being passive recipients to becoming actively involved. Thus without improvements in care pathways, improvements in referral pathways could not be supported. Equally, without greater precision in the way referral pathways responded to patients, they could not support more dynamic approaches to managing individual patients’ complex of conditions on a through-life basis. being treatment-centric required excellence in the way care pathways delivered treatments. being care-centric required innovation in the way care was delivered over time within the context of patients’ lives. Managing the patient’s health risk in this way had to be supported by an approach focused on multiple episodes of care provided through the life of the patient’s condition. So how was architecture to be intervened on in such a way as to achieve these benefits? The conclusion we reached was that a proactive, demand-driven East-West dominant approach was needed to achieving step-change; and that a North-South dominant approach, based on encouraging Trusts to make step-changes through implementing published best practice guidelines, would not work. 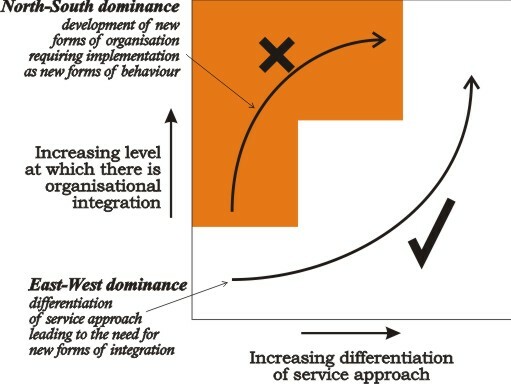 Understood in terms of the following diagram, moving ‘across’ to the right involved responding increasingly to the particular needs of the individual patient, while moving ‘up’ involved changing the organisation of the architectures within which this responsiveness could be made affordable and practicable on a sustainable basis. In a North-South dominant approach (up-and-over), new architectures were designed by top management, and then ‘implemented’ through imposing step-changes on the way clinicians could use them to respond to patients. This was the ‘command-and-control’ approach to change, which, to be successful had to be successful at anticipating the full complexity of behaviours involved in responding to patients. This was never possible in practice. 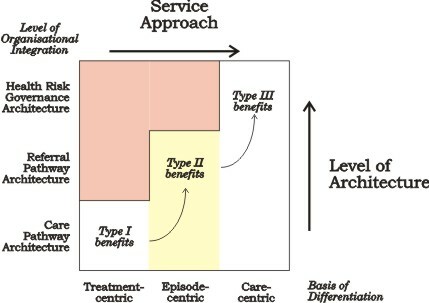 In contrast, an East-West dominant approach (across-and-up) rested on clinicians being expected to provide greater responsiveness in the way they meet their patients’ needs, the sustainability of this responsiveness depending on their being provided with the means of dynamically aligning the supporting architectures. This approach to change could be successful because it was able to work with the full complexity of the patient situation ‘at the edge’ of the Healthcare system. So what made this East-West dominant approach to change difficult for National Governments to implement? There had of course to be sponsorship for the changes needed, both at the Trust level and at the National level, in order to create a context within which change could take place. But even given this, the demand-led focus on the need for change then had to be driven from the ‘edge’ by the specific needs of the patient through the life of his or her condition. This in turn required forms of support and transparency that could enable such change to happen, by providing funding for the transition, by providing support for this way of working out how to effect change, and by ensuring that the changes made can be sustained in a way that can be held accountable. This meant being able to sustain power at the edge, and this was a 21st Century Challenge that Governments had not yet learned how to meet. The UK Government recently published a white paper describing a range of proposals designed to improve access to community healthcare services. The intention is to improve healthcare outcomes (including longterm outcomes) for individual patients while reducing the cost pressures on the system as a whole. Proposals include more outreach clinics, a regular healthcare checkup, and “joined-up” care plans. The term MOT refers to the regular system of checks required for all cars in the UK. These proposals appear to shift control of the patient’s healthcare experience closer to the patient, and at first sight might seem to be a sensible and appropriate response to the increasingly asymmetric demand facing the healthcare services. But not surprisingly, the proposals have had a mixed reaction. One of the concerns is the assumption of triage. If we can separate simple cases from complex ones, then nurses and other professionals can take some responsibility for the simple cases, call in the doctors for medium cases, and send the most complex cases into hospital. But this focuses the difficulty on the separation of simple from complex in the first place, which is not just an epistemological difficulty (what are the small signs that this might be meningitis or bird flu, rather than just a bad cold) but ontological (whose notion of complexity is to prevail). A nurse or pharmacist may deal with a backache simply as an acute pain; however, a doctor may be able to see the backache as the first symptom of a chronic disability. And a doctor with a longer-term responsibility for a patient may be able to see emerging patterns in the patient’s condition, that might not be adequately recorded in the patient’s health record. Part of the difficulty is the conflict between the acute and the chronic. Dealing with a chronic condition as a series of acute episodes can be costly and ineffective for the healthcare organization, and typically produces inferior long-term outcomes for the patient. Indeed, acute treatment (such as painkillers) may interfere with (and therefore delay) the diagnosis of a severe chronic condition. Of course, the doctors sometimes protest too much. They complain indignantly whenever they fear nurses invading their professional territory, but of course a lot of the triage is already done not by nurses and healthcare administrators but by the patients themselves – deciding whether a symptom is disturbing enough to justify seeing the doctor. After all, an unnecessary appointment with a doctor is not just a waste of the doctor’s time, it is also a waste of the patient’s time. Busy people often prefer to take a quick painkiller rather than hang around in a doctor’s waiting room. And of course doctors are under extreme time pressure: they often spend their time prescribing painkillers and sometimes fail to recognize the chronic conditions. Clearly there’s a problem if the working practices of doctors are not conducive to the effective deployment of their expensive medical skills. Much of the complexity of healthcare comes from the fact that health is (literally) embodied in the life of the patient; this means that doing healthcare properly means paying attention to the life of the patient. Think of the individual healthcare that a top sportsman gets – with every minor sprain carefully examined for its potential effect on sporting performance, and every medication assessed for its effect on energy levels. But this is often the problem with asymmetric demand – a small number of highly privileged customers get an individually customized service, and everyone else has to accept a one-size-fits-all solution. Is there a way in which highly flexible and customizable long-term healthcare services can be made available to everyone, at a reasonable cost? Oh yeah, technology. Health 2.0. Taking power to the edge is difficult and fraught with resistance. The latest UK proposals are merely the latest in a series of similar proposals, going back over thirty years. BBC reporter Nick Triggle complains of Deja Vu, and lists some of the repeating initiatives from 1976 onwards. Clearly, every reorganization has its perceived winners and losers. In an organization as political (small p) as the UK health service, every reorganization turns into a major battle about the control of healthcare. There is a legacy of suspicion and cynicism, sometimes interpreted as an institutional defence against anxiety. The centre talks about empowering the edge, while at the same time imposing further centralizing controls. Is there any difference this time around?